There is a whole fleet of penguinologists out there this summer. That's after we started sharing the secret world of penguins with visitors through our Penguinology program. Not only are Aquarium visitors getting to see these popular birds up close, they are learning cool facts (have you heard? penguins have ears) during their visit through nifty decoder stations throughout the building. Turn on the tube today and you'll see we're putting penguins on the small screen, too. Here are all three of those spots for your binge watching pleasure! 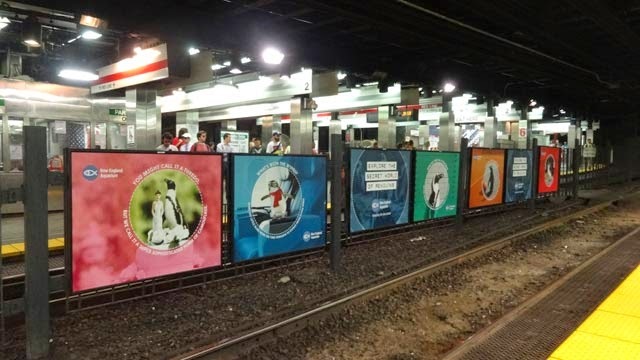 If you wandered around Boston this summer, you may have noticed penguiny advertisements throughout the city. For example, Park Street T station was plastered with penguins and Back Bay had a smashing new look thanks to these perky little birds. 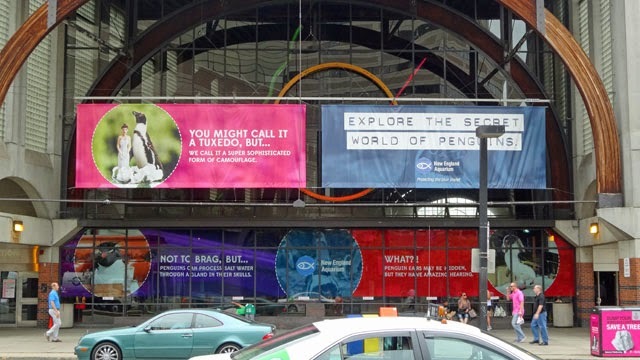 The African, little blue and rockhopper penguins splashed across Park Street station! Big thanks to our advertising partners at Connelly, our photographer friend Keith Ellenbogen and Engine Room Edit for helping us put together this campaign. Because if there's one thing we all need, it's more penguins! Plan a visit to the Aquarium to see what all the fuss is about. You'll get to see more than 80 penguins—three different species—and learn a whole lot about penguins at the Aquarium and around the world. It's time to explore the secret world of penguins!